Young engineers show off their inventions to the Russian president. At the opening of the large-scale aviation event in Zhukovsky (Moscow Region) on Aug. 25, the Russian leader visited a pavilion hosting an exhibition of creations by young engineers, where he was shown a "flying axe" - a ground-controlled gadget that takes off and spins on a cord at up to 16 meters with the help of a small engine. 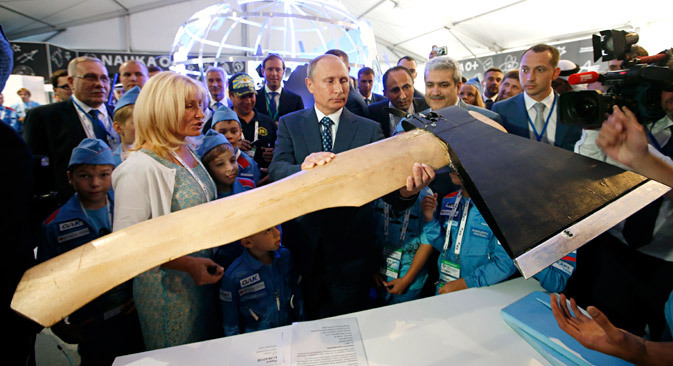 On seeing the 1.5-meter "flying axe," Putin said: "Maybe next time you'll come up with a flying iron." The MAKS Air Show ends on Aug. 30.